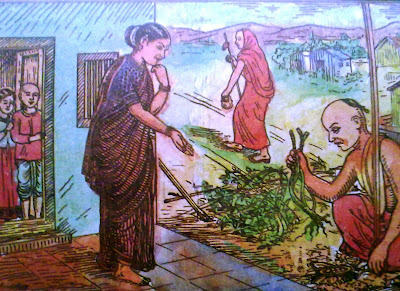 Shri Guru uproots the Ghevada Plant and the Poor Brahmin finds a Treasure. In this Adhyay is described Guru Nath's coming to Panchaganga Kshetra, the holy confluence of the Panchaganga with Krishna River, near Amarapur. (This place later came to know as Narsobawadi).Shri Guru visits a Poor Brahmin's home and out of Compassion decides to end their Poverty. 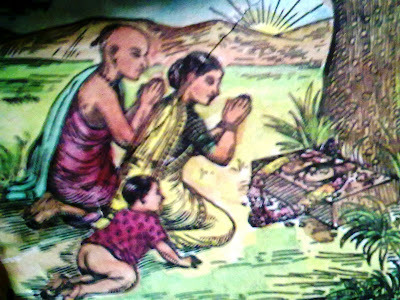 Shri Guru uproots a Plant of Ghevda (A Kind of a Bean), which was the source of food for the Poor Brahmin's family. The Brahmin later discovers a Pot of Gold in that Place. Adhyay 19 - Guru Nath's showering of special Grace on the Yogini-Ganas and Ganganuja's Darshan of Kashi, Prayaga and Gaya - The Holy Triple-Kshetras. This Adhyay describes the Audumbar Vriksha Mahima. It also narrates about the special worship which was being done by the Yogini Ganas to Guru Nath everyday by taking Shri Guru to their place under waters of the River and blesses a farmer called Ganganuj with a Golden Pot at his Feild. Later on Magh Poornima Guru Nath shows Prayaga, Kashi and Gaya to him and makes him complete the whole pilgrimage within just a single day. Sri Narasimha Saraswati later announced that he was leaving form there. He comforts the Yogini-Ganas that although he would be leaving form there, he would still continue to be present there only in his subtle form (Grace-body) and will be answering prayers for all devotees. 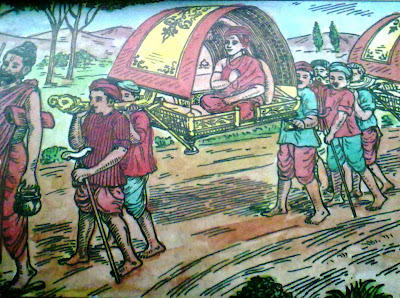 Adhyay 20 - Gangadhar's wife getting riddance from persecution by the Brahmin Ghost. This Adhyay describes that even after the Guru Nath's leaving from Panchaganga Kshetra (Narsobawadi), how his Padukas left under the Audumber Tree continued to respond to the prayers of devotees as per the assurance given to the Yogini-Ganas by Guru Nath. A woman was freed from the Brahma Rakshasa, who caused death to all the children born to her again. The women after worshipping Shri Guru had a dream in which Shri Guru gave her 2 coconuts and as a result 2 sons were born to her. But one of the sons, just when the parents were planning to do his Upanayanam ceremony, dies. 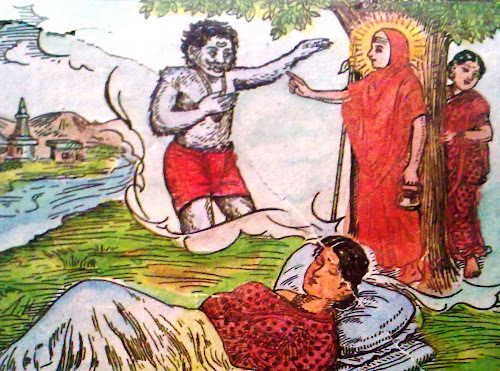 Guru Nath in the guise of a Yogi, appears to her and gives philosophical teaching about the inevitability of death and tries to reconcile her to the event, but the woman remained inconsolable. 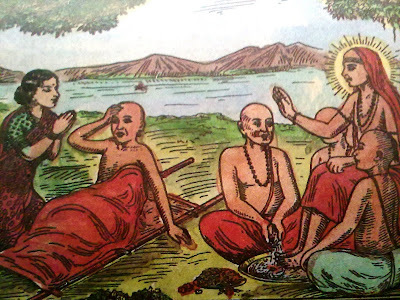 The Revival of the Dead Child (The Gurusthan Mahima). This Adhyay describes how Shri Guru Nath, moved by pity at the sorrow of the woman, brings back to life the dead child. The Advent of Shri Guru Narasimha Saraswati at Ganagapur. From this Adhyay onwards begins the Glorious saga of Ganagapur. 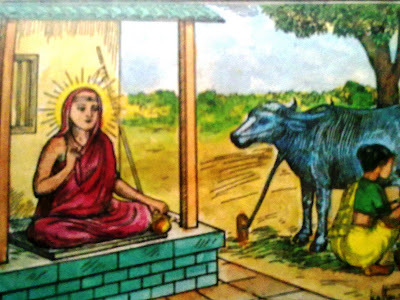 It begins with the narrative of Guru Nath making the old , dry buffalo yielding milk copiously and thus relieving the poverty of a Brahmin couple of Ganagapur. (Study of this Adhyay is believed to grant cattle wealth and prosperity). The Brahma - Rakshasa gets liberation. 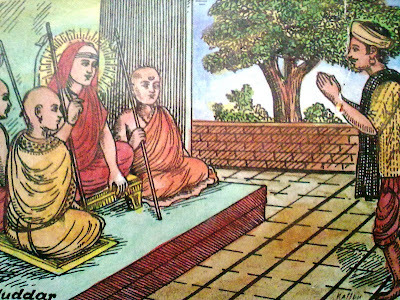 The Gramadhipati went to Sangam and bowed in front of Shri Guru and requested Shri Guru to Stay at Ganagapur.Shri Guru agreed and when they reached South Gate of the Town.A Brahma Rakshas came out of a Peepal Tree and bowed to Shri Guru. After taking bath at Sangam it got Liberated. A Math was established at Ganagapur. (Study of this Adhyay is believed to remove vaastu-doshas and to protect against afflictions from grahas i.e., from evil effects of planets).). 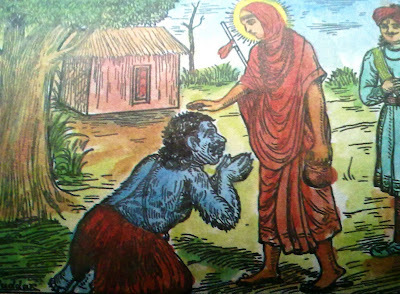 Shri Guru Narasimha Saraswati shows Vishwaroopa to Shri Trivikrama Bharati of Kumasi. There lived a Renowned Pandit called Shri Trivikrama Bharati at a Place called Kumasi Nearby Ganagapur (Presently in Sindagi Taluka of Dist. Bijapur) who was a great Devotee of Lord Narasimha and used to Perform Manasa Pooja. 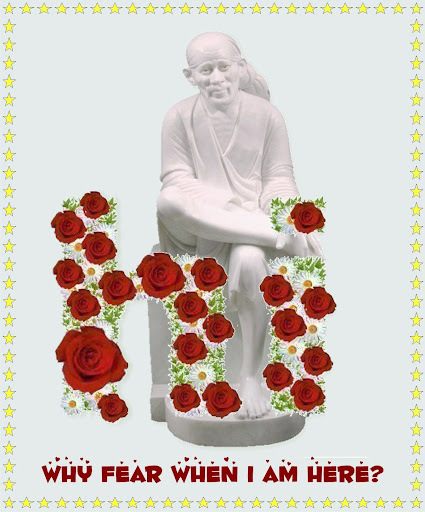 On hearing the Fame of Shri Guru, he reacted saying "Such kind of High Living are not for a Sanyasi and thus criticised Shri Guru in this way. Realising this Shri Guru once asked the Gramadhipati to arrange for a visit to Kumasi. 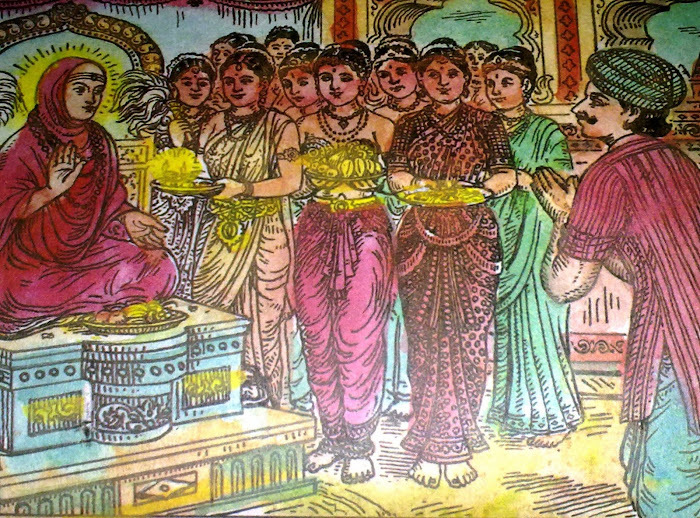 That Day Shri Trivikrama Bharati could not see the Shrine of Lord Narasimha in his Meditation. When Shri Guru reached there , it appeared to him as if all the Persons there are Shri Guru and thus seeing the Vishvaroopa of Shri Guru ,he fell flat before the Procession and Started Praying to Shri Guru. Shri Guru appeared to him in his Real Form in the Procession and blessed him. The Pride and Conceit of the Two Foolish Pandits. There lived a Cruel Muslim King in Vidura who would ask Pandits to recite the Vedas before him and then he would give them a lot of Money. Once 2 Pundits knowing the 3 vedas came to him and asked for the Discussion with the Brahmins over there or else agree there Superiority by giving them a Certificate. In course of time they came to Kumasi and invited Trivikram Bharati for discussion or else demanded a certificate for victory.Trivikram bharati humbly declined to discuss. But due to their persistance he said, `My Gurudeo resides at Ganagapur. Let us go there. You will be given certificates if necessary.' And thus they Come to Ganagapur. The Infinite Glory of the Vedas and their True Purport. This Adhyay describes Shri Narasimha Saraswati explaining to the vain-glorious pundits about the sanctity of Vedic lore and that Vedas are not meant for Vada and polemics. Vedas are verily the mother; they are to be treated with reverence and veneration. They are meant to illuminate our intellect and to help us discover our true self, and are not intended for Jeevanopadhi but for Jeevana-Paramavadhi, they are meant for Bhakti and Mukti and for Bhukti. They are meant for nurturing and enriching the spirit but not for filling and pampering one's being. 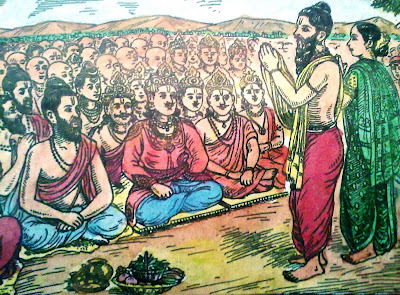 The Harijan's chanting of the Vedic Mantras and Humbling the Conceit of the Foolish Pundits. 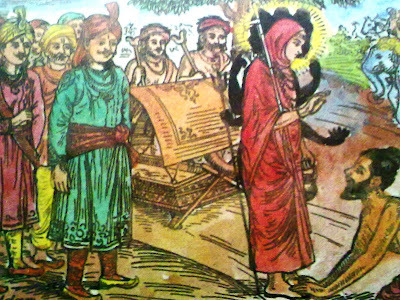 When the Pundits even after listening to Shri Guru, demands the Victory Certificate,Shri Guru asks one of the disciple to call a Harijan Passing nearby and to apply Bhasma (Holy Ash) to him and then to draw 7 parallel lines.Shri Guru asks the Harijan to cross the lines.The lines indicated his 7 Janmas. On crossing one of the line he Says he is a Brahmin named Adhyapak.Shri Guru then asks the Harijan to discuss on vedas with the Two Brahmins. 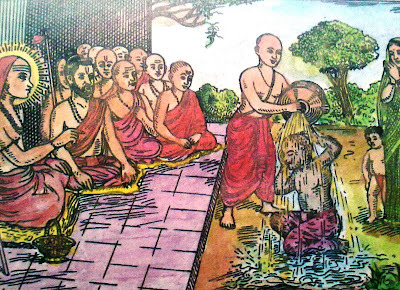 The Brahmins Give up and eventually were punished by Shri Guru to become a Bramha Rakshasa and they leave their Body before even reaching the River for a Holy Bath. Thus Adhyay describes how the two vain-glorious pundits were humbled, and had brought upon themselves a curse which turned them into Brahma Rakshasas. The Significance and the Power of Vibhuti (Holy Ash) and Advice of Karma Vipak to the Harijan. 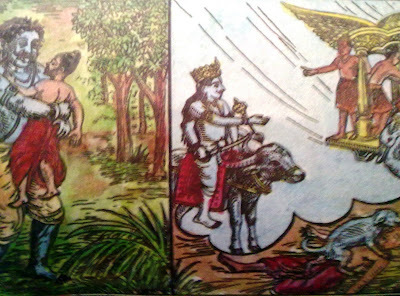 This Adhyay narrates the Story of the momentarily low caste man turned Brahmin who was first unwilling to go back to his home but soon sank back to delusion again, no sooner than the Holy Ash (Bhasma) had been washed off his body, and how he went away home along with his wife and children merrily, forgetting all that had happened just a little earlier. The Significance and Power of the Vibhuti (Holy Ash) further elaborated. In this Adhyay the great power of the Holy Ashes is further explained to Shri Trivikrama Bharati, how by the mere touch of the Holy Ash on the body of the Sage Vamadeva the Maha-Rakshasa got liberated. In the metaphysical sense, Bhasma means destruction of the 'Deha-Buddi' or the 'Deha-Bhranti' i.e. overcoming of the idea and obsession that 'one is the body and nothing beyond that'. One who will have transcended this 'Deha-Bhavana', as exemplified in the person of Vamadeva, will have nothing to fear from. He is indeed the Master of the World. He is the redeemer and rescuer of the fallen and the doomed. He is indeed one with Lord Shiva Himself. A Woman who has Lost her Husband is Consoled by explaining Vairagya and the Impermanence of Life. This Adhyay descibes the story of the young woman Savitri and the death of her sick husband Datta whom she brought all the way from her far away home at Mahur, for Guru Nath's Darshan with great hopes of his recovery. In the mean while, there arrived a bright looking sanyasi who tries Consoling her by explaining the Impermanence of Life. The Supreme Power of Chastity. 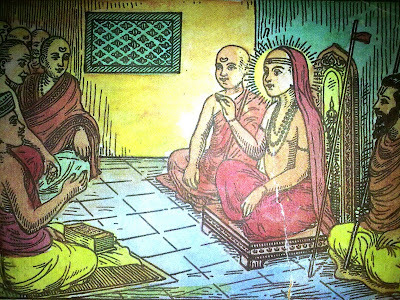 The Sanyasi Explaines the Pativrata-Dharma, the Code of Behavior of a Devoted Wife by Narrating the Story of Agasti Muni and his wife Lopamudra.The Code was said by Brahaspati to Lopamudra at Kashi. The Sanyasi explains Behaviour of a Widow and the Dead Husband was Made Alive by Shri Guru. The Young Women Prepares for observing Sati and as asked by the Sanyasi she sets out for the Darshan of Shri Guru at Sangam. All the way she prays to Shri Guru and bows to Shri Guru on reaching. Shri Guru blesses her Saying "Soubhagyavati Bhava ". 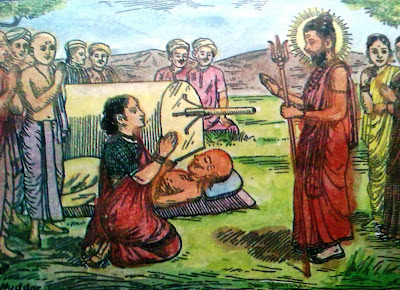 On being said by the Disciples that her Husband is already dead, Shri Guru asks them to bring the Dead Body and Sprinkle the Holy Teerth of Rudrabhisheka. Shri Guru then looks at him with his Sight full of Nectar and the Brahmin youth sat up as if aroused from Sleep. Page created in 0.326 seconds with 69 queries.